Ever since sellers started selling through Amazon FBA and earning the lives they know they deserve, they’ve wanted to learn how to accurately predict the future profits. After all, what’s better than an investment or business where you know almost down to the penny how much you will earn? And thanks to applications like the Jungle Scout Chrome Extension and Jungle Scout Web App, tens of thousands of Amazon FBA sellers have done just that. 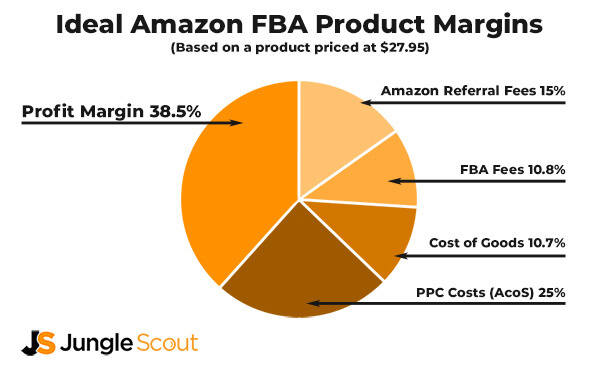 However, one major cost estimation has long been a mystery: Amazon PPC costs. In this article, I’m going to teach you how to estimate your Amazon PPC costs using a fast and simple trick called the 2.5 Rule. This Rule will not only help you predict what your future Amazon PPC costs will be, but it will also give you an edge on your competition and potentially double your profits. What is the 2.5 Rule? You are selling or going to sell a product on Amazon priced between $18-$30. The product has the typical Amazon conversion rate of 10%. That means for every 10 people who click on your product, 1 of those people makes a purchase. Your target ACoS is 25% of your sales price. If you follow our guidelines for research and sourcing profitable Amazon FBA products, then all three of these assumptions should be correct. When researching keywords for your Amazon PPC ads, each keyword should cost no more than 2.5% of the product’s sales price. For example: say you’re selling a long-handle garlic press for $27.95. You discover that the Amazon PPC costs to get your product to the first page of search results for the keyword “long-handle garlic press” is $0.56 per click. $0.56 per click is less than 2.5% of your sales price. Therefore, that is a good keyword to target. Another example: you’re still selling the long-handle garlic press for $27.95. This time, you want to go for the broader keyword “garlic press” minus the “long-handle.” It’s a more competitive keyword, costing $1.23 per click. That’s 4.4% of your sales price. So that might not be the best keyword to target, especially if you want to get a healthy profit margin. How is the 2.5 Rule calculated? The math is quite simple. If you are selling a product on Amazon that has a 10 percent conversion rate, that means it takes on average 10 clicks to make a sale. If your target ACoS (actual cost of sales) is 25% of the total sales price, then your average Amazon PPC costs need to be 2.5% of the total sales price. Here’s the long version for the formula for calculating it. In other words, simply multiply your product’s sales price by 0.025 and presto! You have your target Amazon PPC Costs. How can I predict Amazon PPC Costs in advance? The easiest way to predict Amazon PPC Costs is through Jungle Scout’s Keyword Scout tool. Keyword Scout actually gives you real live Amazon PPC Costs taken directly from Amazon. 1 – Login to the Jungle Scout Web App. 2 – Once in the Web App, click on the Keyword Scout tab. 3 – In the search bar, enter a search term or ASIN that you wish to research Amazon PPC costs for. 4 – When the results load, review the keywords provided and the Amazon PPC costs. It’s really that simple and only takes a few seconds. How do I build a keyword list using the 2.5 Rule? Now that you’ve used Keyword Scout to perform Amazon PPC Costs research, you’ll want to select the keywords that will not only get your product seen by more shoppers, but also keep your ACoS below 25%. IE less than 2.5% per click. One easy way to build this list is by sorting the list of keywords provided by Keyword Scout in ascending order of Exact PPC costs. From there, simply start copying down (or exporting using the CSV tool) all of the keywords that are less than 2.5% of your product’s sales price. For example, you can see that we have “garlic tools kitchen”, “garlic storage”, and “stainless steel ginger grater” as good potential keywords for our garlic press. Each has a cost per click less than 2.5% of our target $27.95 sales price. How do I know if a product is too competitive using the 2.5 Rule? As a rule of thumb, you might try to get the sum of the search volume for each of your 2.5 Rule keywords to be 3,000+ monthly searches. Any less than that, and you might find it difficult to move inventory. Furthermore, try not to leverage the monthly searches on only one keyword, especially if it’s something obvious or short tail. Can I raise my product’s price to meet the 2.5 Rule? Obviously, raising your product’s price beyond your initial target sales price will make your margin for Amazon PPC Costs much wider. For example, if I raised my garlic press’ price by $10 to $37.95, that would make my target Amazon PPC Costs $0.95 per click. That’s a much easier margin to work with! However, raising your price too high above your competitors’ prices might lower your conversion rate significantly. So, instead of selling a product every 10 clicks, it may take 15 to 20 clicks to sell your product. At that point, the 2.5 Rule doesn’t work as well. I recommend keeping your sales price no more than 30% higher or lower than the average sales price. So if garlic presses are selling for $25 on average on Amazon, your price should be somewhere between $17.50 and $32.50. A few more tips for estimating Amazon PPC costs. Higher prices equals lower conversion rates. Try to learn what your average conversion rate will be before pricing out your Amazon PPC ads. The lower your conversion rate, the more clicks it takes. Here’s a quick cheat sheet for conversion rates and clicks. Your target ACoS doesn’t have to be 25%. Once you subtract your Amazon fees and costs of goods sold, you might have a larger gross margin to work with than others. In this case, you can always raise your target ACoS above 25%. Just remember that the bigger your ACoS is, the less profit you’ll make. So if you have a gross margin of 50% after fees and product costs and decide to target a 40% ACoS, that only leaves 10% for your profit margin! Amazon keyword reports will help you get even more accurate details on costs per click and conversion rates. You should run these reports at least once a week for a few months after launching a product. You can find your keyword reports in Amazon Seller Central > Reports > Advertising Reports. ABR – Always Be Researching. Use Keyword Scout frequently to find new keywords. Remember, Keyword Scout generates a list of keywords based on keywords and ASINs that you enter in the search box. Eventually your keyword reports will direct you to your highest converting keywords. So, take those words and put them into Keyword Scout again. Bam! A whole new set of ultra-relevant keywords emerge, ready for you to put them into your Amazon PPC campaigns. Keep this up for a year and you’ll find yourself with a massive list of high converting, long tail keywords. 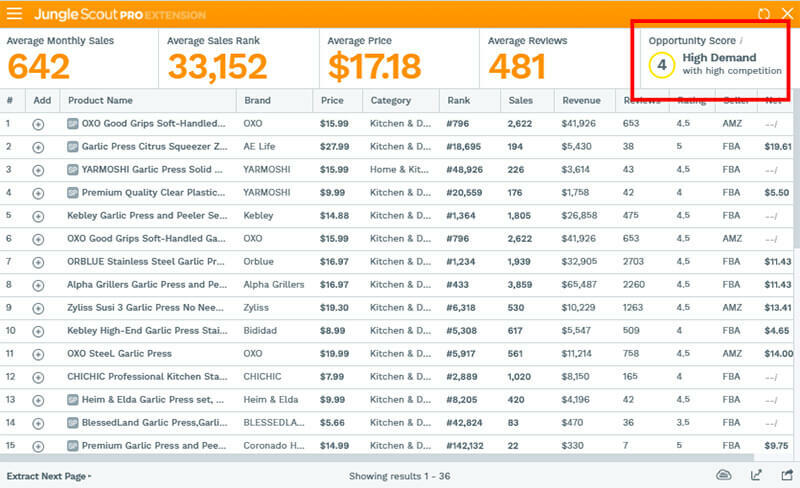 The seller who continues to do Amazon keyword research and track their Amazon PPC costs is the seller who ends up dominating their category and earning the highest profits. How do I get Keyword Scout? Keyword Scout is part of the Jungle Scout web app suite of tools. If you already have access to the Jungle Scout Web then good news. You already have Keyword Scout! To learn more about the Jungle Scout Web App, click here. Thank you so much for this information, it is really helpful. Blessings for your success! Is there a tool like this for the UK? When I go on the Keyword scout on Junglescout, it only lets me select the US market. My product will be selling for around £25 on the UK market (around $32) as I’m offering a much higher quality version of the product compared to competitors. The average price on Junglescout for most keywords related to my product is around £15. The current sales to reviews is 360 to 149 what do you guys think my PPC will be? Currently, Keyword Scout is only available in US markets. I have JungleScout Web App, but I cant simply change the country from US to UK in KeywordScout. All other countries are disabled. Do we know why are they disabled? Currently, Keyword Scout is not available in the UK. That may change in the new year. This is a very informative and helpful article, thankyou. However, are we really expected to believe that the opportunity exists in todays Amazon landscape to purchase products for $2.80 and sell them for $28!? I do not know of a single retail operation, major or minor, who achieves margins such as these. A $2.80 product will typically be being sold already in a retail environment for around $12 depending on the tax, with direct importing retailers being even more competitive still. I understand that your example is a perfect case scenario, but can we really offer that up as a remotely realistic proposition!? Yeah, the opportunity still exists, so long as you’re not trying to compete on price alone. My latest product I just purchased for $3.50 and I’m selling for $30+. And one of my mates does the same, but for $50+. If you find a good enough market or your product is marketed very well, it is possible. Thanks for the information. It really helped me pick out which keywords would work with the profit margins I am seeking. I did have a question though. This formula seems like it is good for predicting the cost of PPC or HSA per unit. If I am trying to estimate how much the total cost of PPC per month will be, and not just per unit…would it be more accurate to multiply the PPC by average sales or by 10% of exact match search volume? PPC usually is a percentage of your total sales (or should be). And keep in mind that it often comes out of your payments, so you never actually have to pay it forward. But if you were expecting $3,000, just make it a percentage of that value, say 25% or so to be safe. 1. I’ve looked at hundreds of products to date. I cannot meet the Amazon combined Fee of 25.6%(based on your graphic) at price points that are below a certain amount. I don’t know how sellers who sell products under $20 make any money. For instance, a product that weighs only 1.3 pounds and sells for $14.99 has an FBA cost of $5.63 and a Referral Fee cost of $2.25. That’s almost 50% of the price of the unit. QUESTION: How do you find products that meet the 25.8% target in your graphic? 2. Cost of Goods: Where did you get this number from? 3. What do you consider a good profit on an item? That’s worth the time and effort to research, ship, build the product page for, etc? 1) Yeah, if you’re selling below $20, it’s going to be tough to hit that number. I recommend looking at products that are made out of steel, leather, and wood. Usually, they have a higher perceived price and a relatively low cost. Silicone, plastic, glass all tend to go for cheap. And try to stay away from stuff that weighs over 1 lbs. $3.19 is where you want your FBA fees to be. Also, the average price doesn’t mean the price you’ll sell for. I look for stuff that I think I can sell for $30 or more and weigh less than one pound. 2) Experience mostly, and glancing at Alibaba’s SERP. 3) I’m more interested in ROI than anything. If I can buy a chunk of products for $2000 and earn $15,000 net in the first 12-months, that makes me happy regardless of how many I sell. For margins, I tend to see 30-35% of my current product line-up, but I’m happy if it’s anything north of 20%. I see what your saying about the rule of thumb. Thanks to your 2.5% rule of thumb I’ve realized that a few of the products I was looking at were ultra competitive even though they looked like a good opportunity on the chrome extension. Expensive PPC would have been the last thing I needed especially since I am just starting out. Yeah, ad costs is a dead giveaway if a category is too expensive. You CAN succeed without using ads, but it requires a whoooole lot of giveaways using super URLs. Some sellers use that as their strategy, but in my opinion it’s a lot of work for not a lot of return. I prefer higher priced products with fatter margins sold at lower volumes (so I don’t have to spend as much on an initial order). Your blogs are so helpful! Seriously don’t stop I love reading them. I have a question about something you said. You say to “try to learn what your average conversion rate will be before pricing out your Amazon PPC ads.” How do you do this? Well, starting out it’s pretty tough to guess it, obviously. But I find that most conversion rates for products under $25 are typically around 10% (unit/session percentage that is). Sometimes it’s better, sometimes it’s worse. So the 2.5 Rule is more of a “rule of thumb” since 10% CVR = 10 clicks per sale. And if your ACoS is 25%, then 25%/10 = 2.5%. Once you know your real CVR, though, you can adjust accordingly. – Is it that we are forever adding new keywords to our ppc campaign, with the ultimate goal of having a small group of low acos keywords ? Or is it that my high acos keywords today, will not be my high acos keywords 2 years from now, because the market evolves ? – How do events like Prime Day and holiday shopping affect ppc ? My observation is that everything goes out of whack. For example, in the weeks leading up to Prime Day, I’ve had to bump up bids just to get impressions, and that’s thrown off my acos too. Is this your experience as well ? 1) Yes on both parts! Haha… sorry if that’s vague. But yeah, we always want to keep optimizing ads. Because search trends change. And eventually, as new people come in to sell similar products to your own, some keywords will get less while others become more. 2) It affects it quite a bit. As I write this, my PPC costs are through the roof because of Prime Day. However, conversions go up, too, so while your CPC ends up being more, it takes less clicks to get a sale. A lot of people right are adding stuff to their cart in anticipation of making bulk purchases on Prime day, too. Same thing happens around the holidays. You burn a lot of PPC in October/November and then it all comes rushing out in December. Really interesting answers. And really helpful for me. It seems like ppc is essentially about continuous improvement (constantly monitoring and adding keywords, and related metrics like acos). My only thought there is that it takes some time for acos to settle and trend downwards, so I am concerned about profitability if we are always tinkering with our ppc campaign. Would you say that optimization must involve adding all those new keywords to our listing as well over the years? Another thing I wanted to share is that I launched another product at the end of June, and despite high discounts on jump send, people seem to be requesting (and getting) coupons from me, but not really using them or adding to cart. Its been extremely frustrating, but I suspect they are holding on to these for prime day. Or I am missing something entirely. Either way, I run my coupons so that they expire week to week, to minimize any abuse. Just wondering if you’ve seen that sort of thing before. I really appreciate you taking the time to answer our questions given all the other demands on your time! It took me about 3 months to get my ACoS down and my margins around 35%. And that was on a product priced at $22.50. But it hasn’t stopped me from continuing to do research, review keyword lists, and add and remove keywords. Not sure on why coupons weren’t being used. And you could be right–it could be people waiting for Prime Day. Or just getting distracted. Great article, these are the fine tunes distinguishing the great from the average seller.